"Send to an External Media Player" tracks all the possible streamable media sources in your browser tabs and offers to send them to the VLC, MPlayer, or Media Player classic external music player. Upon sending the streams, the current browser player goes to the pause state (if any player element is detected) and media will be played in the external music player application. This way you can take advantage of your external player's power and lightness. This extension is very lightweight compared to the other similar extensions. Basically, there is no need for a persistent background script on this add-on and hence it does not consume any memory nor CPU while it is inactive. Also, it can record DASH-type media and successfully send them to the external player while others can't. What are the supported external media players? What is "Send to VLC (VideoLAN) media player" extension and how does it work? This extension is a rewrite of "Open in VLC" by @belav. The idea is similar. Basically, both add-ons monitor network activity and if a streamable media is detected, they offer to send the media to VLC. 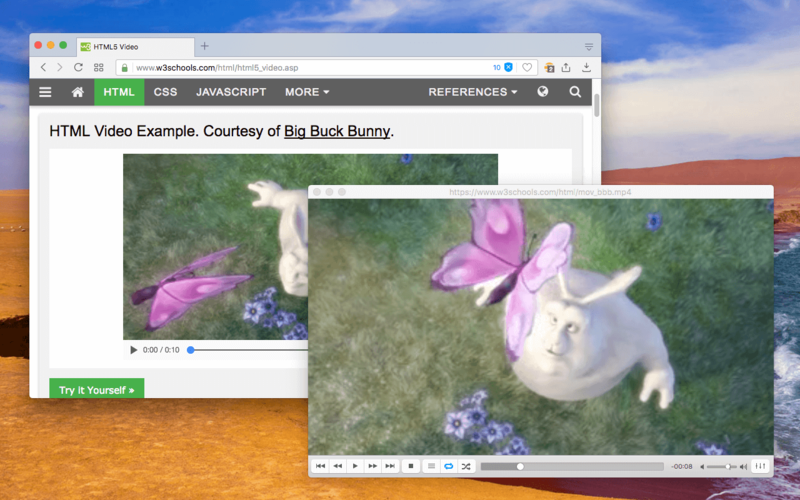 There are many advantages of watching a media over VLC compared to the built-in players like CPU and memory usage and ability to adjust different parameters. The main difference between this add-on and "Open in VLC" is that there is no network observer module in this add-on. Basically, the extension grabs media sources from web pages directly instead of installing an observer. This way extension can have nonpersistent background page and consequently use no memory and CPU usage while it is inactive. Beside this fundamental difference, this add-on handles multi-segmented media sources better than "Open in VLC". You can read FAQ2 for more info. What does the toolbar badge number mean? When a streamable media is detected, you will get an increment on the toolbar badge number of the current page. Nowadays most websites offer media playing in segments. Basically, a single long media file is split into different segments and when a segment is done being played, another segment is fetched from the server. This method is very useful to reduce the load over servers and basically, users do not feel the difference until they want to stream the URL in an external player like VLC. Since there is no single URL for the entire media anymore, by sending a URL just a portion of media is being played in the external player. "Send to VLC (VideoLAN) media player" however, catches all the streams that are already loaded by the page and send them all to the VLC media player as a "m3u8" file. So basically if you wait enough for all the resources to be fetched by this extension before requesting play with VLC you will get a complete set of URLs. Just look at the toolbar badge number and when the number is not incrementing anymore, it is the time to request VLC play. What happens if the toolbar badge is empty and still the button is pressed? If toolbar badge is empty, it means that the extension was unable to record media from the current page. When toolbar button is pressed, the main URL of the top-level document is sent to the VLC media player. As you may know, VLC knows how to deal with some websites and hence sending the URL might just work! Why do I need to install a native client for this extension to work? Extensions based on WebExtension technology has no OS level access. So basically without a native wrapper, there is no way to call VLC media player from an extension. This small native client is a fork from github.com/openstyles/native-client. This native client is based on NodeJS and allows privileged code to be run on the extension side. Note that there is no need to run the installer with administrator privilege.